The card that I drew for myself this evening is one that I don't recall ever getting before (at least not in recent memory)- THE FOUR OF WANDS. It symbolizes happiness in regard to relationships. I've been single for a long time, so this is quite promising. I'm not exactly looking for love at the moment but I'm always open to its possibility. 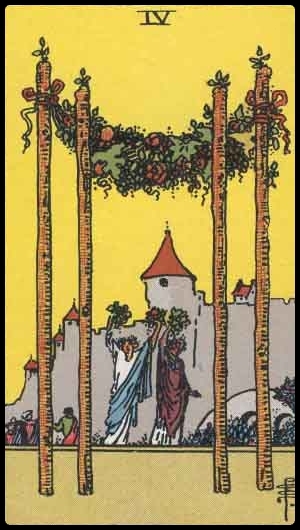 The Four of Wands heralds celebration, good times, a happy and harmonious home environment and good news. In numerology, four symbolizes stability and firm foundations, and in the case of the Four of Wands, you are now enjoying a period of happiness and stability. This card indicates a sense of harmony and balance as well as completion, and thus symbolizes a time of peace and joy in life that come as the result of often difficult and challenging effort. The Four of Wands is one of the most positive cards in the Tarot deck and indicates general good fortune, satisfaction, and fulfillment. With the Four of Wands, it is the perfect time to get together with your family and friends and to celebrate all the wonderful times that you have had together. Often, this card reflects the holiday period where you get together with the extended family and join in a celebration. Alternatively, it may be as simple as inviting your closest friends over for an intimate dinner and a few glasses of nice wine. The Four of Wands often points to a marriage, engagement, birth of a child, a birthday, graduation or other type of celebration that marks a special milestone. If you have been working on a project, you will reach an important milestone and will have cause to celebrate. You have completed a significant phase of the project and can feel very proud of what you have accomplished so far. This card augurs a time of joy and satisfaction in life and represents the personal gratification of a job well done, a goal attained, and a vision beginning to be realized. Given the Four of Wands is closely associated with the home environment, you may be working on improving or renovating your home. You may have recently purchased a new home or are very close to finding a new home and getting ready to settle down in your new environment. The Four of Wands indicates peace, harmony and tranquility. You may find a refuge from the turmoils of life, perhaps by meeting someone new in a romantic setting, or by finding a new place to live that is ‘away from it all’. If you have been experiencing any disagreements with others, now will be the time to make a peace offering and instead focus on creating harmony in the relationship. *Looking forward to seeing RHCP live in the (hopeful) near future!